Students at the Narsimpalli Schoool are using discussion and sharing as tools to enhance their learning at the school. This is an innovative strategy to not only broaden their knowledge base but also strengthen their communication skills and instill a sense of confidence in the student. The activities undertaken at the school are in the form of reading news articles from a variety of subjects to the students. Another student initiative involves a person discussing a topic of their choice with the other students. Yet another arm of learning through discussion is the general knowledge question activity, which spans a range of topics and students not only answer the questions but also frame the questions. Narsimpalli head master Mr. Mahaboobbasha, teacher Mr.Krishna and students celebrate their new laptops. Dell Computers donated 25 laptops to RDF schools this month, a gift worth Rs 6,25,350. The laptops will greatly improve students’ computer skills. The gift will especially help schools like Wadlakonda and Redlawada, which currently only have one computer each. 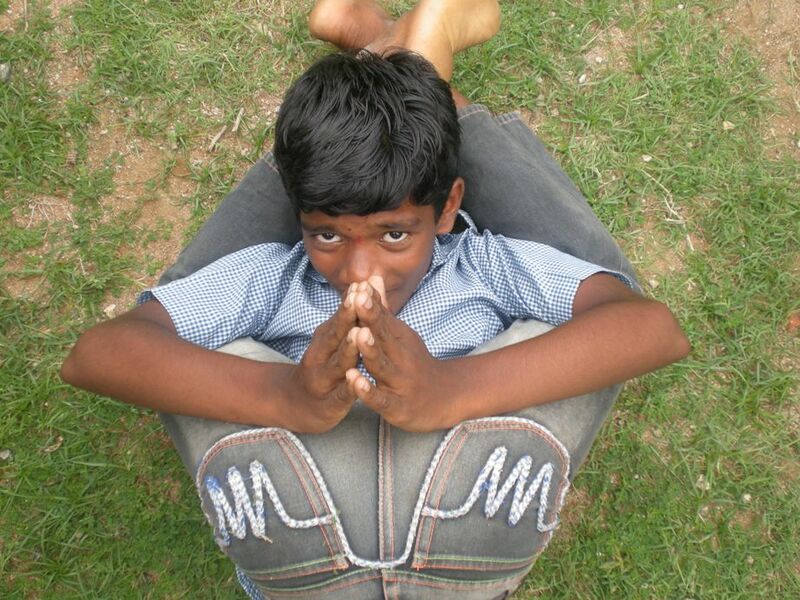 This is Dell’s first donation to RDF, and we thank the company for its generosity to the students of Andra Pradesh! Wadlakonda’s new PET teacher is bringing great enthusiasm to his new job. In addition to regular physical education classes, B. Prabhaker has introduced special yoga and pyramid classes after-school. Fifty students have signed up and are doing their nimble stretches in the afternoon. B. Prabhaker wants to eventually take all yoga trainees to district and state level competitions. He also wants to train girls in games like kho kho & volley ball. The students of Narsimpalli’s 5th & 6th classes have come up with a creative way to combine nature and learning. They are growing plants on the school campus and have named their plants after scientists, freedom fighters and notable figures including Nobel laureate C.V. Raman, Maharani Lakshmi Bai and track star P.T. Usha. In addition to watering the plants daily, students can offer narrations of their favorite people. Although B. Veeranna graduated Kalleda school and now studies at the National Institute of Technology in Warangal, he regularly returns to his alma mater. B. Veeranna — who attended Kalleda from 3rd to 10th class — also visits other RDF schools, helps with the Youth Empowerment Program, the Social Awareness Program and conducts career guidance classes for 10th grade students. 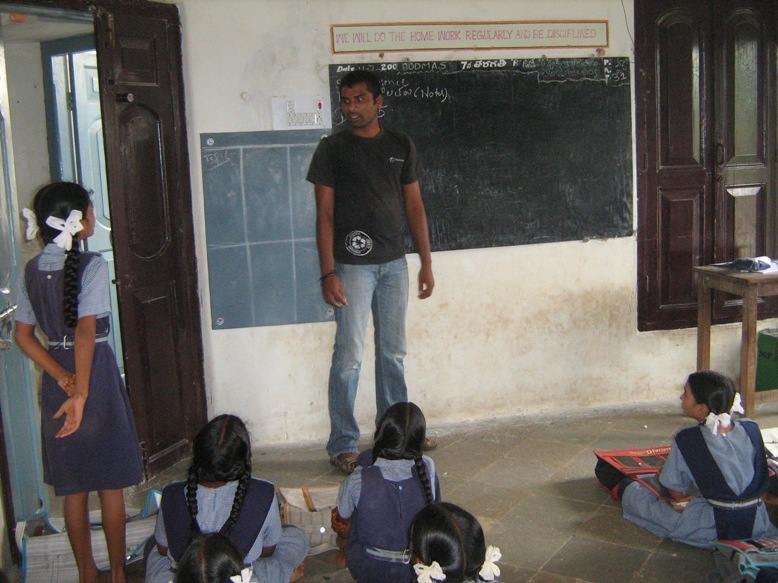 In addition to assisting the students, B. Veeranna regularly translates from Telugu to English for the volunteers. Students and staff at RDF’s VAPV Junior College have begun at Clean and Green program. Every Saturday, they dispose of waste papers, small stones and other debris littering the area to keep the campus clean and promote a good atmosphere. 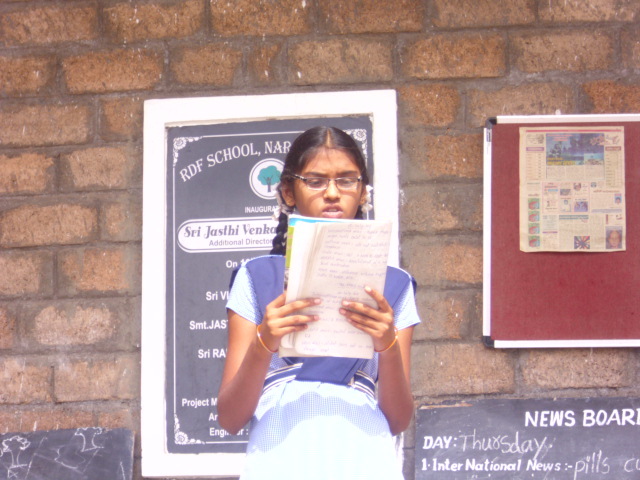 B. Marasa grew up speaking Telugu, a language she shares with her parents, her village and her classmates at Kalleda Rural School. But she spent four weeks this summer practicing English, hoping the skill will secure her future. “It is a global language,” she said. That sentiment was shared among the 20 RDF students from Kalleda, Matendla and the Junior College who were chosen to attend a spoken English course sponsored by GE Volunteers. It is the fourth year RDF students have participated in the program. The students, mostly children of rice, cotton and pepper farmers, hope their improved English will boost their career prospects. Many want to work in call centers; others plan to enroll at universities to study medicine, engineering and politics. 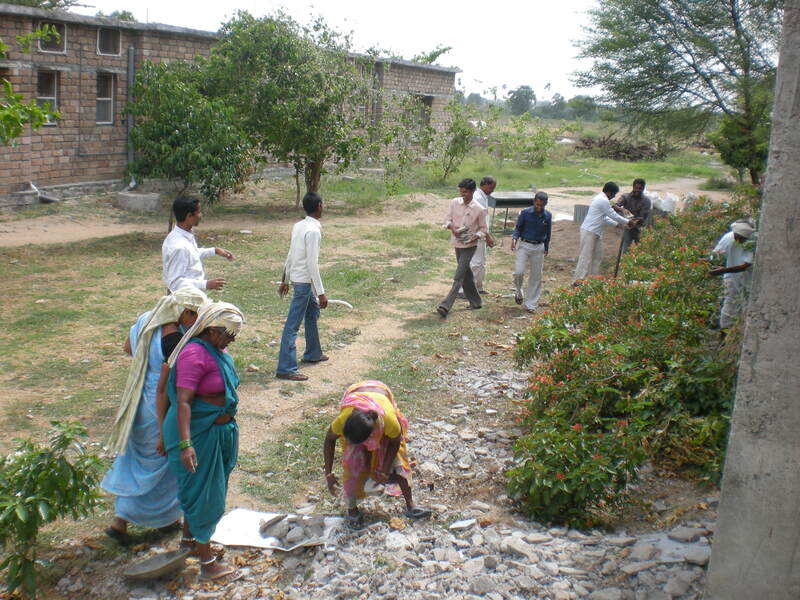 The program was held at GE’s offices in Hyderabad’s Hi-tech neighborhood. Students said Andhra Pradesh’s capital was vastly different than their village homes, where there’s little pollution and traffic is caused by the occasional herd of passing goats and cows, not endless streams of honking autos and motorcycles. But they said they enjoyed their stay and the field trips to the public gardens, Birla temple and the Imax movie theater. But most of their energy was spent perfecting their spoken English. Students said they especially focused on areas like contradictions, intonation and tenses.